NOTICE: Activation key must be used on a valid Steam account, requires internet connection. 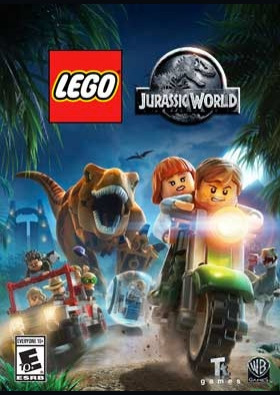 ABOUT THE GAME Following the epic storylines of Jurassic Park, The Lost World: Jurassic Park and Jurassic Park III, as well as the highly anticipated Jurassic World, LEGO Jurassic World™ is the first videogame where players will be able to relive and experience all four Jurassic films. Reima… gined in LEGO form and told in TT Games’ signature classic LEGO humor, the thrilling adventure recreates unforgettable scenes and action sequences from the films, allowing fans to play through key moments and giving them the opportunity to fully explore the expansive grounds of Isla Nublar and Isla Sorna. KEY FEATURES Relive key moments from all four Jurassic films: An adventure 65 million years in the making - now in classic LEGO brick fun! Wreak havoc as LEGO dinosaurs: Choose from 20 dinosaurs, including the friendly Triceratops, deadly Raptor, vicious Compy and even the mighty T. rex. Customize your own dinosaur collection: Collect LEGO amber and experiment with DNA to create completely original dinosaurs, like the Dilophosaurus Rex. Populate and explore Isla Nublar and Isla Sorna: Put your unique dinosaur creations in to paddocks as you complete special Free Play missions. Play with family and friends : With easy access drop-in, drop-out gameplay option. (Available on console only.) SYSTEM REQUIREMENTS Windows Minimum: OS: Windows®XP SP3, Windows Vista/7/8 with latest service packs and updates installed Processor: Intel Core 2 Duo or equivalent AMD dual core CPU Memory: 2 GB RAM Graphics: NVIDIA GeForce 7600GS or ATI Radeon 1950, 256 Mb RAM DirectX: Version 10 Network: Broadband Internet connection Hard Drive: 10 GB available space Additional Notes: Windows XP and DirectX® 9.0b and below not supported Recommanded : OS: Windows XP/Vista/7/8 Processor: Intel i5, 4 x 2.6 GHz or AMD equivalent Memory: 4 GB RAM Graphics: NVIDIA GeForce GTX 480 or ATI Radeon HD 5850 or better, 1Gb RAM DirectX: Version 11 Network: Broadband Internet connection Hard Drive: 10 GB available space Additional Notes: Windows XP and DirectX® 9.0b and below not supported Mac Minimum: OS: 10.9.5 Processor: 1.8 GHz Memory: 4 GB RAM Graphics: AMD Radeon 4670, NVIDIA GT120 or Intel HD4000 with 256Mb VRAM or better Hard Drive: 15 GB available space Additional Notes: The following graphics cards are not supported: ATI X1xxx series, ATI HD2xxx series, Intel GMA series, Intel HD3000, NVIDIA 7xxx series, NVIDIA 8xxx series, NVIDIA 9xxx and NVIDIA 3xx. This game is not currently supported on volumes formatted as Mac OS Extended (Case Sensitive). Recommanded : OS: 10.10.3 Processor: 2.4GHz Memory: 8 GB RAM Graphics: AMD Radeon 6970, NVIDIA GeForce 650M or Intel Iris Pro with 1GB VRAM or better Hard Drive: 15 GB available space Additional Notes: The following graphics cards are not supported: ATI X1xxx series, ATI HD2xxx series, Intel GMA series, Intel HD3000, NVIDIA 7xxx series, NVIDIA 8xxx series, NVIDIA 9xxx and NVIDIA 3xx. This game is not currently supported on volumes formatted as Mac OS Extended (Case Sensitive).